Goldrake’s Theme Found In Malta’s Eurovision Entry? 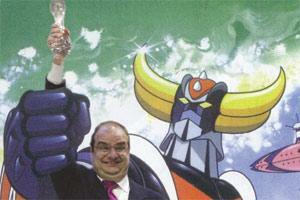 Goldrake’s theme is apparently found in Malta’s Eurovision entry, On Again Off Again, by Philip Vella (seen in the faked photo with Goldrake) . I disagree actually and I cannot see that it was lifted – it’s sounds different to me. Also he is incorrect in saying that it plays only using Windows Media Player. I use Media Player Classic and it plays well just the same. “One of the weekly highlights of my childhood in the late 1970s was huddling up in front of the TV with my cousins to watch Goldrake save the earth from alien attack. This was one of the first UFO cartoons to hit our airwaves (courtesy of RAI). Like many other childhood experiences, Goldrake was relegated to the nether regions of memory a long time ago. It rocketed back to consciousness when I heard On Again… Off Again . A few bars into our latest Eurovision Song Contest offering and anyone who remembers Goldrake’s Italian signature tune (Albertelli/Tempera/Bandini, 1978, Cetra) will immediately spot the uncanny resemblance. You can download a video of the opening or closing of the Goldrake sequence at http://www.actarus.it/Robots/robots_file/goldrake/video.htm… (requires Windows Media Player) or listen to a midi-version at http://www.thejackal.it/index/goldrake.htm by clicking on the white box just below the headline. I have also attached an image I have generated on my computer. I’m sure Philip Vella will take it lightly! Fans of Goldrake should know that a fan project is underway to produce a non-profit Goldrake fan movie called “The Ufo” by the GTGroup. These are the same who created a fan movie for Lupin 3 (Called “1 MINUTE FOR AN HERO” by Telecioccaweb International from the original Warinhari-TCI motion picture “5 MINUTES FOR AN HERO”). Some DVD’s are out of the original series yet they are in Japanese. There’s no demand for an english version yet an italian version should be out later this year.